Objective To assess the effects of didgeridoo playing on daytime sleepiness and other outcomes related to sleep by reducing collapsibility of the upper airways in patients with moderate obstructive sleep apnoea syndrome and snoring. Setting Private practice of a didgeridoo instructor and a single centre for sleep medicine. Participants 25 patients aged > 18 years with an apnoea-hypopnoea index between 15 and 30 and who complained about snoring. Interventions Didgeridoo lessons and daily practice at home with standardised instruments for four months. Participants in the control group remained on the waiting list for lessons. Main outcome measure Daytime sleepiness (Epworth scale from 0 (no daytime sleepiness) to 24), sleep quality (Pittsburgh quality of sleep index from 0 (excellent sleep quality) to 21), partner rating of sleep disturbance (visual analogue scale from 0 (not disturbed) to 10), apnoea-hypopnoea index, and health related quality of life (SF-36). Results Participants in the didgeridoo group practised an average of 5.9 days a week (SD 0.86) for 25.3 minutes (SD 3.4). Compared with the control group in the didgeridoo group daytime sleepiness (difference −3.0, 95% confidence interval −5.7 to −0.3, P = 0.03) and apnoea-hypopnoea index (difference −6.2, −12.3 to −0.1, P = 0.05) improved significantly and partners reported less sleep disturbance (difference −2.8, −4.7 to −0.9, P < 0.01). There was no effect on the quality of sleep (difference −0.7, −2.1 to 0.6, P = 0.27). The combined analysis of sleep related outcomes showed a moderate to large effect of didgeridoo playing (difference between summary z scores −0.78 SD units, −1.27 to −0.28, P < 0.01). Changes in health related quality of life did not differ between groups. 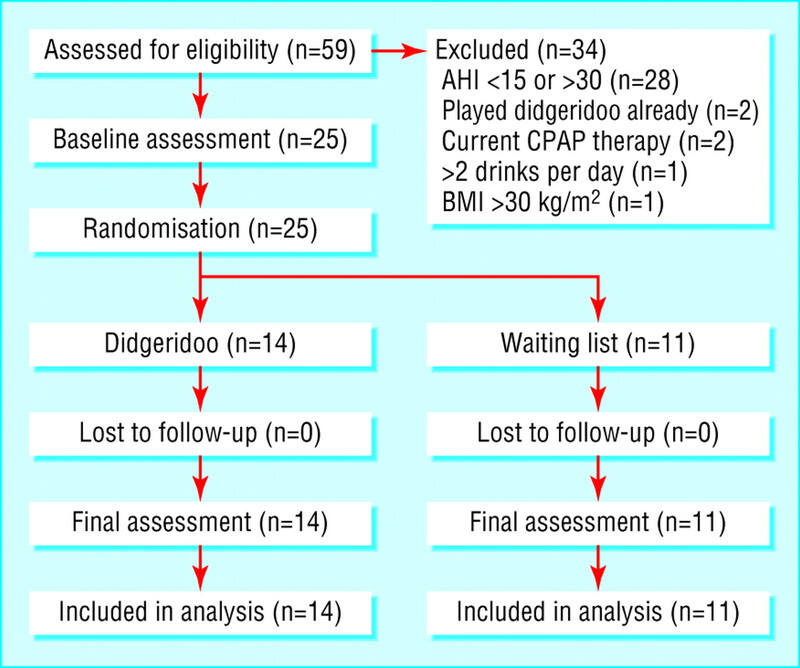 Conclusion Regular didgeridoo playing is an effective treatment alternative well accepted by patients with moderate obstructive sleep apnoea syndrome. AS, a didgeridoo instructor, reported that he and some of his students experienced reduced daytime sleepiness and snoring after practising with this instrument for several months. In one person, the apnoea-hypopnoea index decreased from 17 to 2. 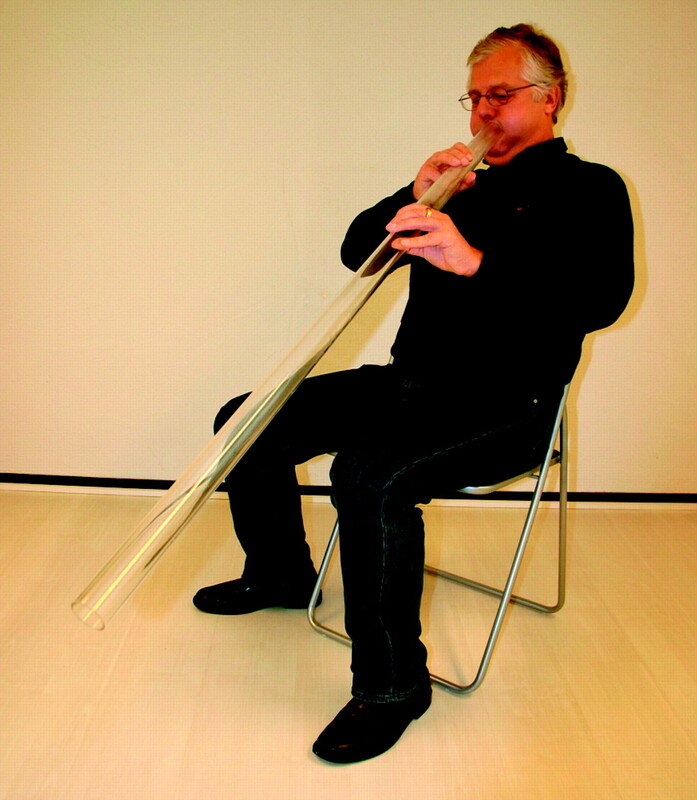 This might be due to training of the muscles of the upper airways, which control airway dilation and wall stiffening.8 9 10 We tested the hypothesis that training of the upper airways by didgeridoo playing reduces daytime sleepiness in moderately affected patients. We included German speaking participants aged > 18 years with self reported snoring and an apnoea-hypopnoea index of 15-30 (determined by a specialist in sleep medicine within the past year). Exclusion criteria were current continuous positive airway pressure therapy, use of drugs that act on the central nervous system (such as benzodiazepines), current or planned intervention for weight reduction, consumption of ≥ 14 alcoholic drinks a week or ≥ 2 a day, and obesity (body mass index ≥ 30 kg/m2). We recruited patients at our study centre (Zuercher Hoehenklinik Wald, Wald, Switzerland) and one private practice in Zurich. Physicians at the study centre assessed all potential participants for eligibility. Those willing to participate provided written informed consent. After study enrolment, all patients completed a baseline assessment. We randomised enrolled patients into an intervention group with didgeridoo training or a control group. We used STATA software (STATA 8.2, College Station, Tx) to generate the randomisation list (ralloc command) with stratification for disease severity (apnoea-hypopnoea index 15-21 or 22-30 and Epworth score < 12 or ≥ 12). The randomisation list was concealed from the recruiting physicians and the didgeridoo instructor in an administrative office otherwise not involved in the study. We used a central telephone service, which the didgeridoo instructor used to obtain group allocation. Participants in the intervention group started their didgeridoo training after the instructor received group allocation. The instructor (AS) gave the first individual lesson immediately after randomisation. In the first lesson, participants learnt the lip technique to produce and hold the keynote for 20-30 seconds. In the second lesson (week 2) the instructor explained the concept and technique of circular breathing. Circular breathing is a technique that enables the wind instrumentalist to maintain a sound for long periods of time by inhaling through the nose while maintaining airflow through the instrument, using the cheeks as bellows. In the third lesson (week 4) the didgeridoo instructor taught the participants his technique to further optimise the complex interaction between the lips, the vocal tract, and circular breathing so that the vibrations in the upper airway are more readily transmitted to the lower airways.11 In the fourth lesson, eight weeks after randomisation, the instructor and the participants repeated the basics of didgeridoo playing and made corrections when necessary. Participants had to practise at home for at least 20 minutes on at least five days a week and recorded the days with practice and the practice time (answer options for 0, 20 or 30 minutes). Participants received a standardised acrylic plastic didgeridoo that was developed by the instructor in collaboration with Creacryl GmbH (Ebmatingen, Zurich, Switzerland, and costs €80 (£43; $94), fig 1). The didgeridoo is 130 cm long with a diameter of 4 cm and an elliptical embouchure with a diameter of 2.8-3.2 mm. Acrylic didgeridoos are easier for beginners to learn on than conventional wooden didgeridoos. Participants in the control group remained on a waiting list to start their didgeridoo training after four months. They were not allowed to start didgeridoo playing during these four months. Our primary outcome was daytime sleepiness as measured by the Epworth scale, which has been validated in German speaking patients.12 Scores range from 0 (no daytime sleepiness) to 24, and scores > 11 represent excessive daytime sleepiness. Secondary outcomes included three additional sleep related outcomes measures: the apnoea-hypopnoea index, the Pittsburgh quality of sleep index, and a partner's rating for sleep disturbance. The cardiorespiratory sleep study was performed at the sleep laboratory of the study centre with a computerised system (SleepLab Pro, Jaeger, Hoechberg, Germany), according to the guidelines of the German Society for Sleep Medicine.13 We measured airflow using nasal and oral thermistors and a nasal canula with a differential pressure flow sensor. We defined episodes of apnoea as cessation of airflow of > 10 seconds with decrements of blood oxygen saturation of ≥ 4%. Hypopnoea was defined as a reduced airflow for at least 10 seconds with decrements of blood oxygen saturation of ≥ 4% or waking, or both. The person who analysed the sleep recordings was blinded to group allocation throughout the trial. The partners (when present) rated their sleep disturbance by the participants' snoring during the previous seven nights on a visual analogue scale from 0 to 10. The visual analogue scale was similar to a Borg scale and had verbal descriptors for 0 (not disturbed at all) to 5 (severely disturbed), 7 (very severely disturbed), 9 (very, very severely disturbed), and 10 (extremely disturbed). The partners completed the scale independently from the participants and sent it back to the study centre. We analysed all data on an intention to treat basis. For the primary analysis we compared change scores (differences between baseline and follow-up) between groups using two sample t tests. We also performed an analysis of covariance with the primary and secondary continuous end points at four months after randomisation as the dependent variables and their baseline values, markers of severity of disease (apnoea-hypopnoea index and Epworth score), weight change, and group allocation as independent variables. We selected the Epworth scale as our primary outcome but also considered the three other sleep related outcomes (apnoea-hypopnoea index, Pittsburgh quality of sleep index, and partner rating). To provide an overall estimate of the effects of didgeridoo playing on the four outcome measures we used a summary measure described by Schouten.17 Briefly, for each patient and outcome we calculated a z score (difference of individual change minus overall mean change score/overall SD of change score) and then a summary score as the average of the four z scores. We compared these summary scores between the groups using a two sample t test. For all analyses, we present 95% confidence intervals and considered P ≤ 0.05 as significant. All statistical analyses were performed with SPSS (12.0.1, Chicago, Ill). Figure 2 shows the study flow from screening of potential participants to the final assessment. We included 25 patients from August 2004 to April 2005, all of whom completed the trial. Table 1 shows the participants' characteristics and the baseline values of the outcomes measures. Most patients were men, aged about 50, and had an average apnoea-hypopnoea index of 21 and excessive daytime sleepiness (mean Epworth scores 11.8 in the didgeridoo group and 11.1 in the control group). The Pittsburgh quality of sleep index indicated impaired sleep quality (5.2 and 5.8) and the partners of the study participants on average had severely disturbed sleep (5.6 and 5.5). The SF-36 scores were in the range of the normal population with exception of the mental component and vitality scores, which were lower (reference scores of 50 for mental component and 63.3 for vitality). On average, participants in the didgeridoo group practised on 5.9 days a week (SD 0.86, range 4.6-6.9) for 25.3 minutes (3.4). There were no adverse or unexpected events in either group. 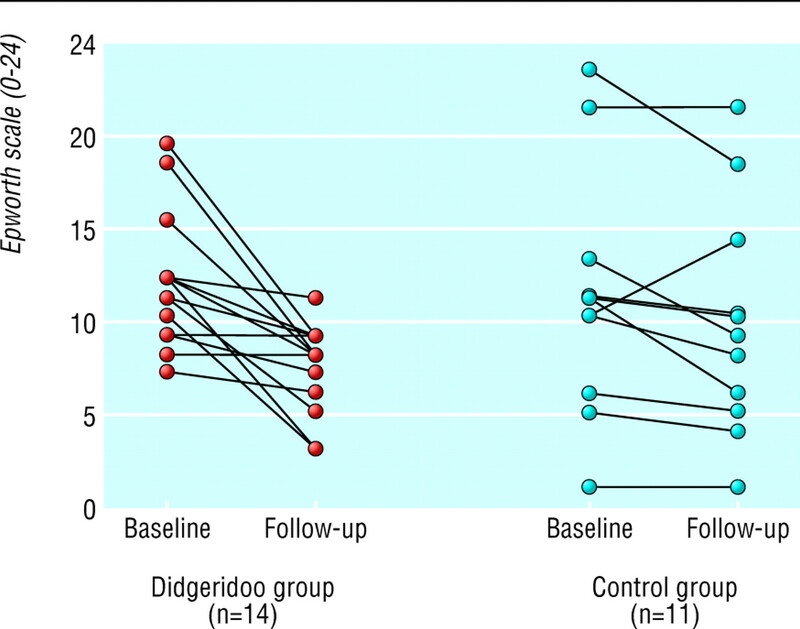 Table 2 shows the effects of didgeridoo playing on the four sleep related outcomes. The primary outcome (daytime sleepiness as measured by the Epworth scale) improved significantly in the didgeridoo group compared with the control group (difference −3.0 units, 95% confidence interval −5.7 to −0.3, P = 0.03). Figure 3 shows the individual responses in daytime sleepiness in the two groups. The quality of sleep did not differ significantly between groups (difference −0.7 units, −2.1 to 0.6, P = 0.27), but the partners of those in the didgeridoo group reported less sleep disturbance (difference −2.8 units, −4.7 to −0.9, P < 0.01). We also observed a significant effect of didgeridoo playing on apnoea-hypopnoea (difference for apnoea-hypopnoea index −6.2, −12.3 to −0.1, P = 0.05). Didgeridoo playing did not have a significant effect on any domain of the SF-36. Adjustment for severity of the condition and weight change during the study did not alter the results substantially for any outcome. Figure 4 shows the combined analysis of the four sleep related outcomes. The summary z scores differed by −0.78 (−1.27 to −0.28, P < 0.01), favouring the didgeridoo over the control group. In this randomised controlled trial we found that four months of training of the upper airways by didgeridoo playing reduces daytime sleepiness in people with snoring and obstructive sleep apnoea syndrome. The reduction of the apnoea-hypopnoea index by didgeridoo playing indicated that the collapsibility of the upper airways decreased. In addition, the partners of participants in the didgeridoo group were much less disturbed in their sleep. Earlier studies about the effects of electrical neurostimulation or training of the respiratory muscles showed no improvement in daytime sleepiness11 or the apnoea-hypopnoea index18 or were limited by the lack of a control group.10 Our results are the first to show that training the upper airways significantly improves sleep related outcomes. The larger effects we observed may be due to the longer duration of our intervention and the training of the whole vocal tract instead of only single muscles. A meta-analysis of trials evaluating continuous positive airway pressure therapy in patients with moderate to severe obstructive sleep apnoea syndrome showed an average effect of −3.9 units on the Epworth scale.4 The minimum important difference on this scale for severely affected patients is around 4 units.19 In our trial, the mean change score in the didgeridoo group was −4.4 units and the difference between the intervention and control group was −3.0 units. Thus the effect of didgeridoo playing seems to be slightly smaller than with CPAP therapy. However, we expected smaller effects because our patients were only moderately affected so that results are likely to be less pronounced. One of the challenges in the treatment of sleep disorders is poor compliance.1 20 Thus new treatments not only need to be effective but also be ones that people are motivated enough to use. Didgeridoo playing seems to meet these requirements. Participants were highly motivated during the trial and practised, on average, on almost six days a week, which was even more than the protocol asked for. Strengths of our trial include the long duration of the training so that effects could develop. Also, we blinded outcomes assessors when possible (sleep studies) and controlled for confounding by restricting the study sample to non-obese patients with little alcohol and drug consumption. A limitation is that those in the control group were simply put on a waiting list because a sham intervention for didgeridoo playing would be difficult. A control intervention such as playing a recorder would have been an option, but we would not be able to exclude effects on the upper airways and compliance might be poor. Another limitation is that the sample size was small. We conducted a proof of concept study and larger trials with more diverse study populations are needed to provide more precise estimates of the treatment effect of upper airway training. In conclusion, didgeridoo playing improved daytime sleepiness in patients with moderate snoring and obstructive sleep apnoea and reduced sleep disturbance in their partners. Larger trials are needed to confirm our preliminary findings, but our results may give hope to the many people with moderate obstructive sleep apnoea syndrome and snoring, as well as to their partners. Contributors MAP, AS, and OB designed and organised the study. AS assigned the intervention. CLC, OB, MH, and AZ collected the data. MAP supervised data collection, analysed data, and wrote the first draft. AS, CLC, AZ, MH, and OB critically reviewed the manuscript, and MAP and OB prepared the final version. OB is guarantor. Funding Zurich Lung Association, Zuercher Hoehenklinik Wald. Competing interests AS is a professional didgeridoo instructor and teaches t'ai chi and qi gong. Ethical approval Ethics committee of the University Hospital of Zurich.
. Obstructive sleep apnea. Ann Intern Med 2005; 142: 187–97.
. Obstructive sleep apnea-hypopnea and related clinical features in a population-based sample of subjects aged 30 to 70 yr. Am J Respir Crit Care Med 2001; 163: 685–9.
. The occurrence of sleep-disordered breathing among middle-aged adults. N Engl J Med 1993; 328: 1230–5.
. Continuous positive airways pressure for obstructive sleep apnoea. Cochrane Database Syst Rev 2002; (2): CD001106.
. Long-term cardiovascular outcomes in men with obstructive sleep apnoea-hypopnoea with or without treatment with continuous positive airway pressure: an observational study. Lancet 2005; 365: 1046–53.
. Early predictors of CPAP use for the treatment of obstructive sleep apnea. Sleep 2004; 27: 134–8.
. Effective compliance during the first 3 months of continuous positive airway pressure. A European prospective study of 121 patients. Am J Respir Crit Care Med 1999; 160: 11249.
. The effect of neuromuscular stimulation of the genioglossus on the hypopharyngeal airway. Laryngoscope 2002; 112: 351–6.
. Tongue-muscle training by intraoral electrical neurostimulation in patients with obstructive sleep apnea. Sleep 2004; 27: 254–9.
. [Submental transcutaneous electrical stimulation for obstructive sleep apnea]. HNO 2003; 51: 966–70.
. Acoustics: the vocal tract and the sound of a didgeridoo. Nature 2005; 436: 39.
. German version of the Epworth sleepiness scale. Respiration 1999; 66: 440–7.
. Guidelines for diagnosis and therapy. In: Schulz H, ed. Kompendium Schlafmedizin für Ausbildung, Klinik und Praxis. Landsberg: Ecomed, 2005.
. The Pittsburgh sleep quality index: a new instrument for psychiatric practice and research. Psychiatry Res 1989; 28: 193–213.
. Test-retest reliablity of the Pittsburgh sleep quality index (= PSQI) in patients with primary insomnia. World J Biol Psychiatry 2001: 374S.
. German translation and psychometric testing of the SF-36 health survey: preliminary results from the IQOLA Project. International quality of life assessment. Soc Sci Med 1995; 41: 1359–66.
. Combined evidence from multiple outcomes in a clinical trial. J Clin Epidemiol 2000; 53: 1137–44.
. Therapy of snoring by respiratory muscle training [doctoral thesis]. Zurich: University of Zurich, 1997.
. Randomized, double-blind, placebo-controlled crossover trial of modafinil in the treatment of residual excessive daytime sleepiness in the sleep apnea/hypopnea syndrome. Am J Respir Crit Care Med 2001; 163: 918–23.
. Randomized placebo-controlled crossover trial of continuous positive airway pressure for mild sleep apnea/hypopnea syndrome. Am J Respir Crit Care Med 1999; 159: 461–7.